Volpak has developed a complete STANDCAP pouch supply chain to satisfy customer demand in the US. It will deliver both horizontal form fill seal (HFFS) and pre-made pouch solutions for their exclusive inverted STANDCAP Pouch solution. Volpak’s HFFS solutions will be available through R.A JONES, a US-based provider of primary and secondary packaging machinery to the food, pharmaceutical, dairy and consumer goods industries. The firm has allied with Glenroy, Aptar, and Viking Masek to provide pre-made alternative solutions in the US market. Volpak’s STANDCAP Pouch solution, which is licensed, is easy to handle and allows forming and filling the pouch while placing and securing the flip-top cap in a single complete system through a horizontal form-fill-seal packaging machine. Glenroy has been opted as the premade STANDCAP Pouch provider, due to its on time delivery of reliable, innovative, and cost-effective flexible packaging solution. The modern pouch dispensing solution of Aptar has an easy to open flip-lid closure and a tamper evident pull ring, and the drip-free and controlled product dispensing will be offered through its SimpliSqueeze valve technology. The fill/seal solutions for pre-made STANDCAP Pouches will be provided by Viking Masek. The STANDCAP Pouch will be apt for packaging a suite of products which include toppings, creams, jellies, cake decorating paste, honey, mayonnaise, ketchup, tomato paste, salad dressings, sauces, conditioner, shampoo, gel, and soap. Volpak will exhibit its STANDCAP Pouches at stalls C-3800 and C-5422 at Pack Expo in Las Vegas on 25 September to 27 2017. R.A JONES, headquartered in Kentucky, US, and Volpak are part of Coesia, Italy-based industrial and packaging solutions provider. Volpak, headquartered in Spain, employs over 500 people and offers form-fill-seal solutions for the pouch packaging industry. 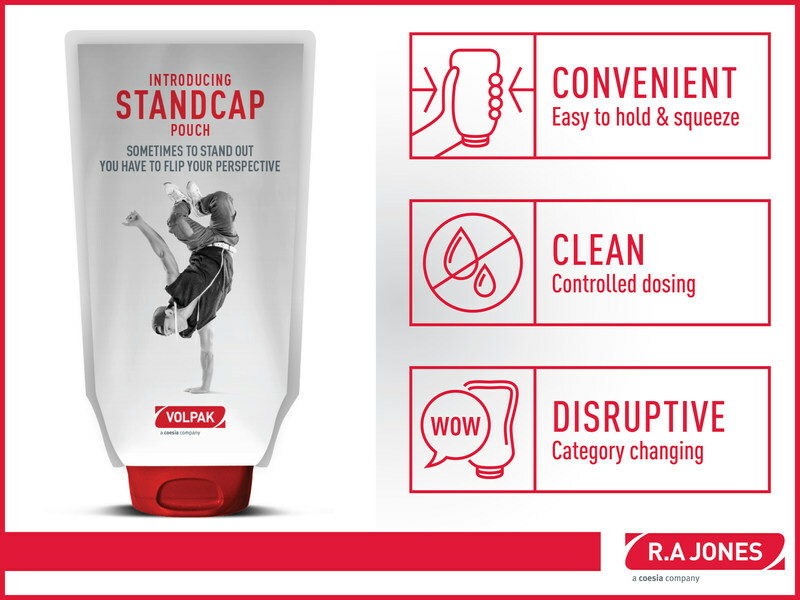 Image: Revitalize signature brands, improve shelf appeal, and enhance the overall customer experience with your product by adopting the STANDCAP Pouch solution. Photo: Courtesy of PR Newswire Association LLC.